The Little John Bottle Brush bush is a great choice for Arizona desert gardening. This little plant looks amazing in the winter/spring. It does great in full sun to partial shade. 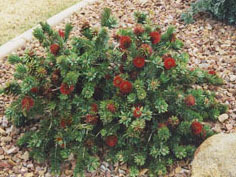 It has little bottle brush shaped flowers that bloom repeatedly all over the bush. Once established, the Little John is a very hearty plant in Arizona. It is a nice ground cover that grows 3’x3′ and will give your desert or tropical landscape some nice color. It is an evergreen shrub so you do not have to worry about cutting it back. Beware in a very cold winter you will want to cover it. The bottle brush is hearty to 20-25 degrees. Drought-tolerant; suitable for xeriscaping, average water needs; water regularly but do not over water, low litter, and is Suitable for growing in containers.